Planning to apply to law school in the fall? Not sure what to write in your law school application? Applicants who plan to apply for law school this fall can get a head start by working on your personal statement and resume this summer! This workshop will cover: What the personal statement and law school resume are; how they complement each other; a plan for how to write the personal statement; tips and suggestions for how to maximize the personal statement and the resume as well as how to make them stand out. Bring your questions! For more information and to register please click on this link so that we can ensure enough seating and materials for everyone. NOW is the time for July LSAT Registration–Planning to take the July LSAT? Demand is high, so click here to register now to get a seat. Fall 2019 Course Suggestions: Still looking for some fall courses? As you know, students in ANY major can attend law school, and there are NO specifically required courses for pre-law undergrads. However, given an interest in law, click on the link here for some fall courses that pre-law students may find particularly helpful and interesting. Are you looking for an exciting way to spend a year abroad starting in the Fall of 2020? If so, it’s time to think seriously about submitting an application for a Fulbright Scholarship! Join us for an informational session and on-campus workshops to learn more. Sessions are targeted to juniors, seniors, and recent alumni who wish to apply for the Fulbright Priority Deadline of June 17, 2019. Elise Harmening is the Owner and Principal Attorney for Harmening Law, LLC. Elise began Harmening Law, LLC as part of the Justice Entrepreneur’s Project through the Chicago Bar Foundation. Harmening Law, LLC is committed to providing legal services for clients who do not fit into the traditional legal services model or qualify for legal aid. Throughout her life, Elise has found a real connection with working with families and youth. She has personal experience working through the school system to advocate for accommodations and understands, intensely, what it feels like on both sides of the table. Harmening Law only deals with family and education law. Interns will be able to learn the ins and outs of family and education law. Harmening Law is offering a paid summer internship of $13 an hour for 10-30 hours a week to one intern. – Currently pursuing an undergraduate degree. elise@harmeninglaw.com. Deadline is April 30, 2019. This workshop will give you tips on how to make yourself competitive for federal government opportunities as well as discuss the benefits of working for the government and how to best navigate USAJOBS.gov and other government resources. The Career Center, 715 S. Wright, offers drop-in service Monday-Thursday from 11 a.m. – 4 p.m. for students with quick career-related questions. American Bar Association Legal Opportunity Scholarship–Applications due May 1. The ABA Legal Opportunity Scholarship Fund will award $5,000 of financial assistance annually to each scholarship recipient attending an ABA-accredited law school. An award made to an entering first-year student may be renewable for two additional years, resulting in financial assistance totaling $15,000 during his or her time in law school. In addition to whether the applicant is a member of a racial and/or ethnic minority that has been underrepresented in the legal profession, the applicant’s financial need; personal, family, and educational background; personal statement; and participation in community service activities will be considered in selecting the recipients. For more information and to apply visit their website here. And check out the PLAS Facebook page for NEW internship opportunities, summer programs and more! For those of you who have not yet secured a job or internship this summer, do not fret, there are still opportunities available! But now is the time to secure those summer jobs and internship positions. For some tips on applications, interviews, and other important things to do to make sure you land the perfect summer internship check out our blog post. 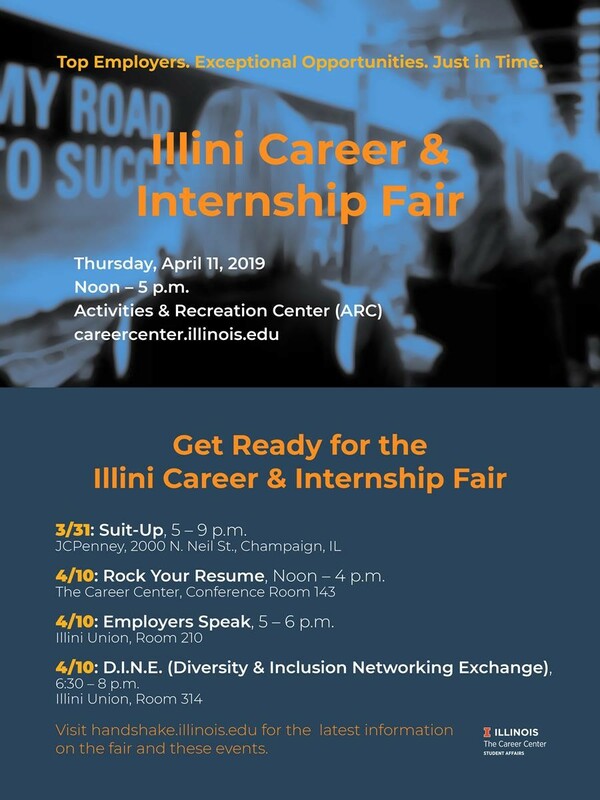 llini Career and Internship Fair, Thursday, April 11, 12pm-5pm, at the ARC!! This career fair is open to all disciplines and is designed to serve as a “just-in-time” fair for students that have yet to secure a summer internship or full-time job after graduation. The Career Center hosts great events for finding an internship. Click Here! The Office of Student Financial Aid offers a Virtual Job Board intended to assist you in finding part-time employment. Click Here! And check out the PLAS Facebook page and Compass Page for NEW internship opportunities, summer programs and more! Taking a Gap Year Before Law School – April 10, 6:00 – 7:00 pm, Gregory Hall Room 319 Nationwide, the average law student has taken one or more gap year(s) after undergrad before applying to law school. Whether you are planning to go straight through to law school after undergrad is over or looking at one or more years before law school, this workshop will help you prepare for that next step. Hear from our panel of current law students from the University of Illinois College of Law and learn more about the pros and cons of both choices. ATTENTION SPRING 2019 GRADS – Check out our Compass page for a recently-updated listing of job opportunities in Chicago, NYC, DC and more! NOW is the time for June and July LSAT Registration–Planning to take the June or July LSAT? Demand is high, so click here to register now to get a seat. During the first two weeks of April, the National and International Scholarship Program will be hosting information sessions for undergraduate students across colleges and fields to learn about some nationally competitive scholarship opportunities. Information Sessions for freshmen and sophomores will be held the week of April 8th: For first and second year undergraduates, sessions will focus on what students should be doing to strengthen their candidacy for various awards. All information sessions will be held in conference room 514 in the Campus Center for Advising and Academic Services at 807 South Wright Street, which is the Illini Union Bookstore building. Tuesday, April 9, Career Fair Prep: Maximize Your Experience 5:30 – 6:30 p.m., The Career Center, Conference Room 143, 715 S Wright St. Employers Speak 5 – 6 p.m., Illini Union, Room 210, 1401 W Green St.
DINE: Diversity and Inclusion Networking Exchange 6:30 – 8 p.m., Illini Union, Room 314, 1401 W Green St.
Drop-in Health Professions Advising: The Career Center, 715 S. Wright, offers drop-in service on Tuesdays and Fridays from 1:30 – 3 p.m. for students with quick questions about health professions. Welcome back! We hope that you had a nice and relaxing Spring Break! Scroll down for information about a Kaplan LSAT prep scholarship, panels on public interest law and taking a gap year, an opportunity to serve as a juror at the UIUC College of Law, gap year job opportunities for spring grads and more! And make sure you check the blog this Wednesday, for our post containing suggestions for Fall 2019 courses. Gregory Hall Room 319 April 10, 20, 6:00 – 7:00 pm. Nationwide, the average law student has taken one or more gap year(s) after undergrad before applying to law school. Whether you are planning to go straight through to law school after undergrad is over or looking at one or more years before law school, this workshop will help you prepare for that next step. Hear from our panel of current law students from the University of Illinois College of Law and learn more about the pros and cons of both choices. The Illinois College of Law Trial Advocacy classes are preparing to put on their final trials this April, and are looking for undergraduate students to participate as jurors. Participants will get to hear either Powell v SuperPulper Inc, a civil suit about a workplace manufacturing death or State v Skywolf, a criminal murder trial. Trials would take place on April 2nd, 8th, 10th, and 11th. Jurors would arrive at the Anderson Courtroom at the College of Law at approximately 4:45, with an expected duration of about 2 and a half hours, and food will be served in an informal post-trial reception with jurors, student attorneys, and guest judges. If you are interested in participating in one (or more) of these sessions, please e-mail Trial Advocacy’s Visiting Law Associate Thanin Stewart at tostewa2@illinois.edu to sign up. NOW is the time for June and July LSAT Registration–Planning to take the June or July LSAT? Demand is high, so click here to register now to get a seat. Now is also a good time to apply for a fee waiver. For more on LSAC fee waivers revisit this blog post. University of Wisconsin PLUS program. Applications due April 12. Saint Louis University School of Law PLUS program. Application priority deadline March 31; regular deadline April 14. Go here for information on cover letter, resume and LinkedIn reviews and other Career Center programming. Here are some additional events of interest. Interested in serving in the United States Peace Corps? Learn about the details of Peace Corps during this monthly session led by the University of Illinois campus recruiter. Work-It-Wednesday is your chance to interact directly with employers. You’ll have the opportunity to ask questions about professional development, get tips and suggestions for your internship/job search, and have your resume reviewed during a full day of events. 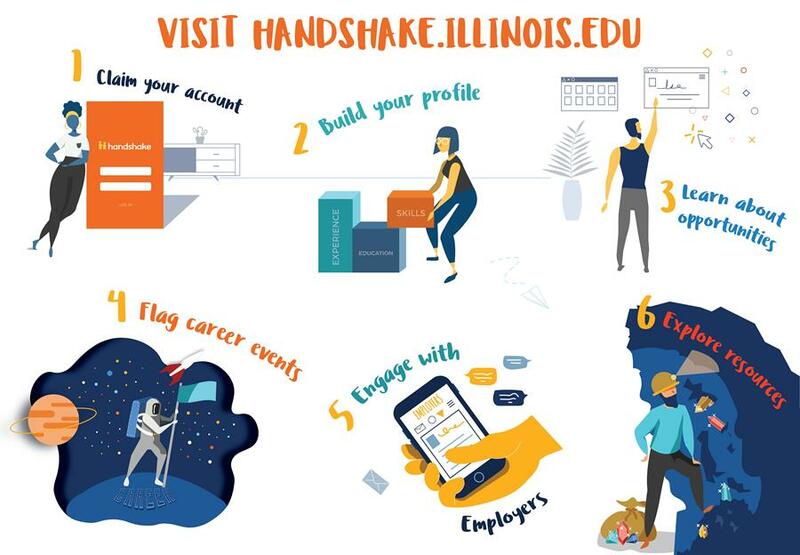 Check Handshake @ Illinois for updated information. Join us at JCPenney where you will receive an additional 40% off all suits, professional attire, and accessories! Get measured for a suit, and get tips and advice on putting together business professional attire. Transportation provided. And don’t forget about the Illini Career and Internship Fair, Thursday, April 11, 1pm-5pm, at the ARC!! LSAT Test Prep Essay Scholarship Contest – Entries DUE April 1, 2019, at NOON! Are you taking the LSAT but not sure you can afford a commercial prep course? Pre-Law Advising Services is pleased to announce that Kaplan Test Prep has donated one full scholarship for one complete Kaplan LSAT prep class. Find out more about Kaplan here. When do you plan to take the LSAT? Have you taken an LSAT prep class before? If so, which one and when? Submit your resume and essay to Judy Argentieri via email only at jargenti@illinois.edu by NEXT MONDAY, April 1, at NOON. Note: Pre-Law Advising Services does not endorse any commercial LSAT test prep company. Did you know that you can get a scholarship for working at an unpaid internship this summer? Apply for the Fred S. Bailey scholarship here, which provides a $1000 stipend for part-time internships and a $2500 stipend for full-time summer internships. Applications due April 8. Carlson Caspers, a top-ranking intellectual property law firm in Minneapolis, MN, offers scholarships for diverse students with technical backgrounds who are interested in going to law school. The Carlson Caspers Diversity and Inclusion 1L Law School Scholarships provide up to two $5,000 scholarships and possible internships and clerkships to prospective law students who will be starting their first year of law school in 2019. We encourage applicants who are pursuing or have obtained a degree in chemistry, physics, life sciences, pharmacy, engineering, or computer science and intend to practice IP law in the Twin Cities upon graduation from law school. These scholarships exist because of the firm’s recognition that diversity and inclusion require ongoing and active engagement within our firm and the broader community. We encourage future advocates for justice to apply. Click on the link below to apply. The application deadline is April 20, 2019. Spring Break Plans For Pre-Law Students!! How can you maximize your spring break? First things first: Get some sleep, watch Netflix, visit your family and friends. Then take a look at these lists to be super productive and make the rest of your semester SO much easier. Complete your FAFSA if you haven’t already. This is how financial aid for federal loans for summer/fall will be determined, whether you are an undergrad or an incoming law student. Registration Advice: For help on selecting pre-law courses, check out our blog post Guide to selecting pre-law coursework for Illinois students! Also, keep a look out for our blog post about our suggested courses for the fall! Undergraduate Jurors Wanted! The Illinois College of Law Trial Advocacy classes are preparing to put on their final trials this April, and are looking for undergraduate students to participate as jurors. Apply for Summer Jobs and Internships. Do you have summer plans locked down? If not, apply for jobs and internships. Check out our internship newsletter over on our Compass page. We’ve also listed LOTS of internships on our Facebook page and on our blog! Use the search box on either of these to find internships. You should also be checking Handshake regularly (or set it to email you when new listings appear). Apply to Summer Pre-Law Programs. These are typically 4-week residential programs to teach the basics of law and how to prepare for law school, and most are free and come with a stipend for selected students. We have been posting these all spring on our blog and Facebook page. Take a look at the Summer Pre-Law Programs spreadsheet on our Compass page, listing over 40 summer programs, for even more opportunities. Note: Some deadlines have passed and others are April 1, so apply SOON. Take a practice LSAT. Not ready to take the real LSAT yet but wondering what it’s all about? Go to this website to download a free practice test. When you’re done, you can score it and watch videos there with explanations of the answers. Want to take more practice LSATs? You can purchase books of 10 previously administered LSATs like this one at Amazon or another bookseller, or used on ebay. Job shadow, or ask a lawyer to spend 30 minutes doing an informational interview with you. Don’t be intimidated; this is an opportunity for you to buy him/her coffee and ask about their professional life. Here’s a resource for planning your informational interview. Get caught up. Use this time to catch up on studying and prepare for finals–those grades are very important to law schools! Taking the June LSAT? You should already have selected your prep option and started studying. Spring break is a great time to crank up your LSAT studying. Tip: REGISTER FOR THE JUNE LSAT NOW, because the popular test sites fill up around spring break each year. Taking the September LSAT? Now is the time to research LSAT prep options. Check out the LSAT Preparation folder over on our Compass page for information on free LSAT resources as well as listings of popular LSAT prep companies. Decide who will be your recommendation writers. You will want to approach them by this May/June (at the end of THIS semester) so that they have plenty of time to write the letter and your performance is still fresh in their mind. If you are an alum, reach out ASAP because the longer you wait the more difficult it is to track people down and for them to remember you. Register for the Credential Assembly Service. This is the account you will need to open in order to have your recommendation letters processed. Once you set it up, your account is good for five years. You can read all about it here. Mark your calendars. We have upcoming workshops just for you that you should plan to attend. Find them all on our Event Calendar. It’s still a good idea to decide who on campus can write your recommendations, and approach them by the end of this semester. If you wait a year or more the professor is sometimes gone, on sabbatical, retired, etc., so it’s better to get them now. Register for the Credential Assembly Service as listed above so that you can send the letters into your account. We will have a special workshop about Taking a Gap Year Before Law School on April 10th from 6:00 – 7:00 pm at Gregory Hall Room 319. This workshop will cover how you can maximize your postgraduate time to make yourself an even better law school candidate, and we will share a timeline and game plan for applying to law school as a working professional. Attendees will also have the opportunity to hear from current law students who worked prior to law school. Complete your FAFSA! Your federal loans will not be disbursed without it. Make final visits to law schools/attend admitted student days. If you’ve decided where to attend, then withdraw from the other schools that have admitted you so that they can offer that seat/scholarship to someone else. Apply for scholarships. We’ve posted lots of scholarships in our blog and over on our Compass page! When you know which law school you are attending, ask your law school financial aid office about scholarship opportunities. Wednesday, 4:00 pm to 5:00 pm The Career Center Conference Room 143. All Illini are invited to the Illinois Latinx Law Forum, a free event featuring law school admission panels, networking, a mock law class, and a law school fair, on March 16 from 8:30-4:30 at DePaul University College of Law. Check out their website for more details and free registration (breakfast and lunch included). This event is free to attend but advanced registration is required! Wednesday, February 27th in Greg Hall Room 223 at 5 PM. Join the Pre-law club and hear from current law students speak about some of their experiences applying to and attending law school. This is a great event if you are planning to apply to law school next year or if you just want to know more about what law school is really like. March 8, 2019 at 8:30 – 11:30 am. Pre-Law Advising Services is offering this opportunity to take a full, previously administered LSAT under timed, proctored, testlike conditions. For information about events and workshops at The Career Center, check out their spring calendar at: https://www.careercenter.illinois.edu/events. The Illinois Latino Council on Higher Education is accepting applications for the ILACHE Scholarship, due March 8. Applicants must be new or continuing Latino/a students with a cumulative GPA of 3.0 who will be enrolled as a full time student in Fall 2019. Click on the link above to access the application. PAID Undergraduate Summer 2019 Internship in New York and in Washington, D.C.! The Brennan Center for Justice at NYU School of Law is a nonpartisan law and policy institute that seeks to improve the systems of democracy and justice in the United States. We work to hold our political institutions and laws accountable to the twin American ideals of democracy and equal justice for all. The Brennan Center’s work ranges from voting rights to campaign finance reform, from ending mass incarceration to preserving Constitutional protections in the fight against terrorism. Part think tank, part advocacy group, part cutting edge communications hub, we start with rigorous research. We craft innovative policies. And we fight for them – in Congress and the states, in the courts, and in the court of public opinion. We are seeking interns to provide research and administrative support for staff in our New York and Washington, DC offices. Only undergraduate students may apply for this internship. Responsibilities: Interns assist with general administrative and clerical work for the Brennan Center, including filing, photocopying, answering phones, shipping and mailing, coordinating meetings, and drafting routine correspondence. In addition to administrative work, interns conduct research on a wide range of issues in both our Democracy and Justice programs; assist with legislative tracking; accompany staff to meetings on the Hill; and complete special projects for the Washington Office Director as needed. Qualifications: Interns must have a passion for social justice and excellent written and verbal communication skills. The ideal candidates are independent, detail-oriented self-starters that are energetic and highly organized. Experience with Windows 2000/XP, Microsoft Excel and Microsoft Word is a must. Interns must be open to evolving responsibilities. Applications due: Thursday, February 28, 2019 by 5pm!! Duration: May – August 2019. To apply, please upload (preferably in pdf) your cover letter, resume, and a list of contact details for three references. In your cover letter, please specify the department that most interests you. No phone calls, please. Undergrad PAID Internship at UIUC in Environmental Humanities for 2019-2020 — Applications due March 1, 2019! Environmental Humanities is environmental studies from a humanistic standpoint. Environmental Humanities pulls from different movements (environmental philosophy, environmental history, ecocriticism, cultural geography, anthropology, and others) to study the relationship between humans and non-human nature, past and present. The IPRH-Mellon Environmental Humanities Research Group is composed of professors, post-doctoral scholars, graduate students, and undergraduates from different disciplines who are united by their desire to understand the human place in nature, as well as to examine critically the way people make meaning of it. The research group seeks three undergraduate interns who will work with the group on their seminars, workshops, and programs for the academic year 2019-2020. Interns will also work with the research group director, Professor Bob Morrissey, to develop their own research projects as well as a research symposium for undergraduates at the end of the spring semester. Interns will work approximately 10-11 hours per week, paid at the rate of $15.75 per hours, and will have up to $600 to support their research. Applicants must be juniors or seniors the year of the internship. For more information and to apply, go here. Remember: The application deadline is by 5:00pm on Friday, March 1! Please address questions to: Dr. Nancy Castro, at ncastro@illinois.edu. –law school fair featuring admissions representatives from law schools around the country. Click here for a list of law schools that have registered for this year’s event. Minnesota Pre-Law Scholars Summer Program – Application Due March 1! Minnesota Pre-Law Scholars (MPLS) is a program that offers a select number of students a free LSAT prep class each summer at the University of Minnesota Law School. Admission is highly selective and based on a holistic review of the MPLS application material. College students considering law school, especially rising seniors and those from groups historically underrepresented in law school, are encouraged to apply. The program is open to undergraduate students and recent graduates from any undergraduate institution. Students will learn about law school admissions preparation from Minnesota Law School staff. The remaining portion of class, taught by an instructor from The Princeton Review, will be dedicated to LSAT preparation and practice exams. There is no cost to participate in MPLS. However, participants must submit a $100 seat deposit which is fully refundable upon successful completion of the program. All books and study materials will be provided. The program will run from early June to mid-August 2019. February is here! And good news – per the famous groundhog Punxsutawney Phil, we only have to endure a few more weeks of winter. So to make sure you can enjoy the early spring promised by the groundhog – time for all of you applicants to wrap things up. First and foremost – if you still haven’t submitted your applications, do so ASAP! For those of you who have already filed your applications, now is a good time to think about a few things. Admitted Student Days Many of you have been admitted to several law schools and are in the process of deciding where you will go next year. Most law schools offer “Admitted Students” days or weekends. We encourage you to try to attend these events for the law schools where you are still considering attending. Remember: you will be spending the next three years of your life there. It is important to determine if the school is a good fit, both in terms of your classmates and the school’s location BEFORE you accept an admissions offer. There is no substitute for a campus visit. Declining Admissions Offers Those of you who have already accepted an admissions offer should notify the other law schools to which you applied that you will not be attending their law school. This allows those schools to plan and to offer admission to another applicant so is the right thing to do. Financial Aid and Housing Once you have accepted an admissions offer, you should touch base with the Financial Aid office to make sure that you have submitted all of the necessary paperwork to secure your scholarship/financial aid package, including your FAFSA. In addition, it is a good idea to reach out to the admissions office to find out the best way to begin researching your housing options. Some law schools actually maintain lists of housing options with reviews by law students. As always, lots of interesting opportunities, including a PAID summer internship in Washington, D.C. Scroll down to learn more! And for those of you planning on taking the LSAT in the next several months, please check out our previous blog posts on “How to decide which LSAT to Take” and “Digital LSAT Updates, Resources and LSAT Bootcamp” before scheduling an appointment with an advisor! Understanding your options before you meet with us will make for a more productive discussion. We have updated our Spring Semester calendar of events on our website here. A 5 step plan for writing the personal statement and resume. Please RSVP by the end of the day TODAY, February 4 by clicking on this link. Workshops with 3 or fewer registrants may be cancelled and converted to individual appointments. LSAT Bootcamp—Mark your calendars for NEXT MONDAY, Feb. 11 at 4:00 pm. What’s covered on the LSAT? What is it really like? How can test takers best prepare? Which LSAT should you take, and how can you plan ahead for a retake? All of this will be covered at LSAT Bootcamp! Visit this website for workshop schedules and more details. Are you new to pre-law at Illinois? Then this event is a great opportunity for you! This workshop will cover: What it means to be pre-law at Illinois; what law schools are really looking for; what pre-law students can do to maximize their undergraduate years; how to build a strong pre-law resume; what resources are available to assist pre-law students at Illinois. For more details and to register, click here. The Career Center is looking to hire new Career Services Paraprofessionals (CSPs) for the 2019-2020 school year! This informational session will detail the qualities and responsibilities we are looking for in our applicants as well as answer all questions. Join us to learn more about the Career Center and what our CSPs do to help students prepare for and excel in their professional careers. Job and internship search tips for international students will be shared in this workshop. In particular, networking-based job search strategies will be taught along with introduction to resources such as Handshake, LinkedIn, and Myvisajobs.com. Please bring your laptop. PAID Undergraduate Summer 2019 Internship in Washington, D.C.! We are seeking interns to provide research and administrative support for staff in our Washington, DC office. Only undergraduate students may apply for this internship. Duration: May – August 2019. To Apply: Please visit https://brennancenter.applytojob.com/…/Summer-2019-Undergra… and upload (preferably in pdf) your cover letter, resume, and a list of contact details for three references. In your cover letter, please specify the department that most interests you. No phone calls, please. Environmental Humanities is environmental studies from a humanistic standpoint. Envrionmental Humanities pulls from different movements (environmental philosophy, environmental history, ecocriticism, cultural geography, anthropology, and others) to study the relationship between humans and non-human nature, past and present. The IPRH-Mellon Environmental Humanities Research Group is composed of professors, post-doctoral scholars, graduate students, and undergraduates from different disciplines who are united by their desire to understand the human place in nature, as well as to examine critically the way people make meaning of it. Diversity Law Day – Indiana University Maurer School of Law – THIS Saturday, February 9, 9:00 a.m. to 3:00 p.m.
Diversity Law Day is dedicated to the idea that the legal profession must reflect the expanding diversity of our society. Joining efforts with the Law School Admissions Council (LSAC), we hope that this day will encourage student from underrepresented and underserved communities to discover career opportunities in law. This day is particularly tailored towards high school juniors and seniors, as well college freshman and sophomores. Contact Kendra Abercrombie at klabercr@indiana.edu or 812-855-2704 if you have any questions. law school fair featuring admissions representatives from law schools around the country. Click here for a list of law schools that have registered for this year’s event. LSAT Bootcamp—Mark your calendars for Feb. 11 at 4:00 pm. What’s covered on the LSAT? What is it really like? How can test takers best prepare? Which LSAT should you take, and how can you plan ahead for a retake? All of this will be covered at LSAT Bootcamp! Visit this website for workshop schedules and more details. Diversity Law Day – Indiana University Maurer School of Law – February 9, 9:00 a.m. to 3:00 p.m.
Diversity Law Day is free to attend, but registration is required for planning purposes. To attend, simply complete the registration form at www.law.indiana.edu/diversity-day. Contact Kendra Abercrombie at klabercr@indiana.edu or 812-855-2704 if you have any questions. law school fair featuring admissions representatives from law schools around the country. Click here for a list of law schools that participated in last year’s event. As we first mentioned in several of our fall blog posts, many law schools host open houses for prospective applicants and all law schools strongly encourage students to visit their campuses. Note: spring semester is a time when many law schools will host events specifically for admitted students. Make sure you check the law school websites to see what types of events the schools in which you have an interest are offering. Listed below are upcoming events for four Illinois law schools. Chicago Kent Law School Open House, Saturday, February 2, 9:00am-2:00pm. For more information or to register, go here. John Marshall Law School Open House, Saturday, February 2, 9:00am-Noon, or Tuesday, February 5, 5:30pm-8:30pm. For more information or to register, go here. Career Center–For information about events and workshops at The Career Center, check out their spring calendar at: https://www.careercenter.illinois.edu/events. Now is a great time to update your resume, plan your job search or summer internship, and get to know their office and resources. The Office of Undergraduate Research (OUR) is now accepting submissions for the 2019 Undergraduate Research Symposium (URS), set for Thursday, April 18. Deadline for submitting an application to the URS is Friday, February 1, 2019, at 11:59 pm. The application can be found here. The URS is the signature event of Undergraduate Research Week (April 14-20), and brings together students, faculty, and staff from all disciplines on the University of Illinois at Urbana-Champaign campus, as well as corporate partners and sponsors, to learn more about undergraduate research and its potential to change the world. Students are encouraged to apply even if titles or abstracts have not yet been finalized – they can be edited. Just make sure the application is successfully submitted by February 1!